I’d been reading one of my favorite dark fantasy/horror writers, Dennis Etchison, when I took to watching the new season of “Unbreakable Kimmy Schmidt.” Now, this show may appear to simply involve wacky hijinks but the connection to the likes of Etchison is significant. 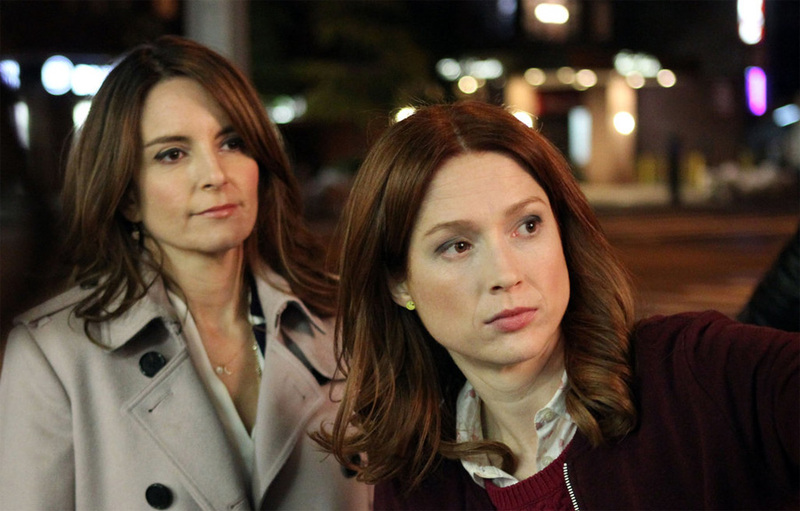 Kimmy Schmidt, created by Tina Fey and Robert Carlock, is a show of high quality in more ways than one may expect. Etchison’s short story, “Inside the Cackle Factory” is quite fitting. Ostensibly, it is about how TV sitcoms get approved. However, the veil of secrecy keeps slipping to reveal sinister underpinnings. And so it is with Kimmy Schmidt: the veil keeps falling. Now, I’m only suggesting a touch of horror. We know it can be a short distance between comedy and tragedy and that horror need not require a drop of blood. Another dark comedy on the same track is the now classic, “Strangers with Candy” (1999-2000) starring Amy Sedaris. This is the show about a 46-year-old former drug addict and prostitute trying to get her life together by literally going back to high school. This is so key to what I’m saying that I’m doing cartwheels right now. “Strangers with Candy” proves that dark comedy is often the best comedy. It had Stephen Colbert and David Letterman involved. And, the cherry on the top is that Amy Sedaris plays an ongoing character on Kimmy Schmidt! Ellie Kemper getting her Kimmy Schmidt on! Amy Sedaris plays the role of Mimi Kanasis, best pal to Jacqueline Voorhees (now Jacqueline White as she is newly divorced from her cheating billionaire husband). If this sounds like a lot of plot development going on with this show, you’d be correct. But it all makes sense. In one respect, the show is sort of spoiler-proof as it is broad comedy on one level, just fun satire like you got from “Seinfeld.” However, it does want to have it both ways with investing in character development. This, odd combination of edgy whimsy and heart-felt exploration of character tends to work out pretty well in this case. 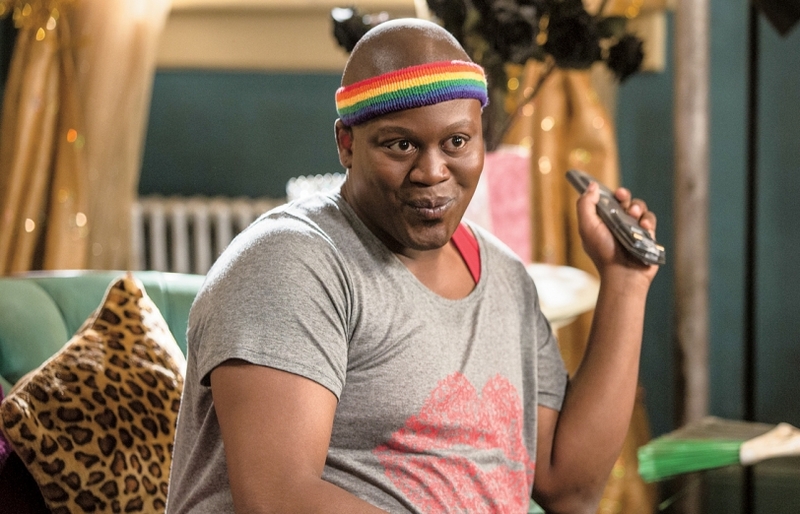 Tituss Burgess as Titus Andronicus, no…Titus Andromedon! The reason for the tension between broad comedy and authentic connection on Kimmy Schmidt is that this show, as opposed to Seinfeld, is about something instead of nothing. It has a pretty heavy premise and the showrunners carry that as a badge of honor: young woman survives fifteen years hidden away in a bunker and now tries to rebuild a life in New York City. It is a premise very much in the spirit of Strangers with Candy. It’s not pure comedy but it provides some of the biggest laughs you’ll find. And it’s definitely NOT a typical comedy-drama, infamously known as a “dramedy.” It is coming from another place. That is why I think the touch of horror is so important: this is a show that is meant to make you laugh as well as unsettle you, take you out of your comfort zone. And, in that regard, it is doing a bang-up job. 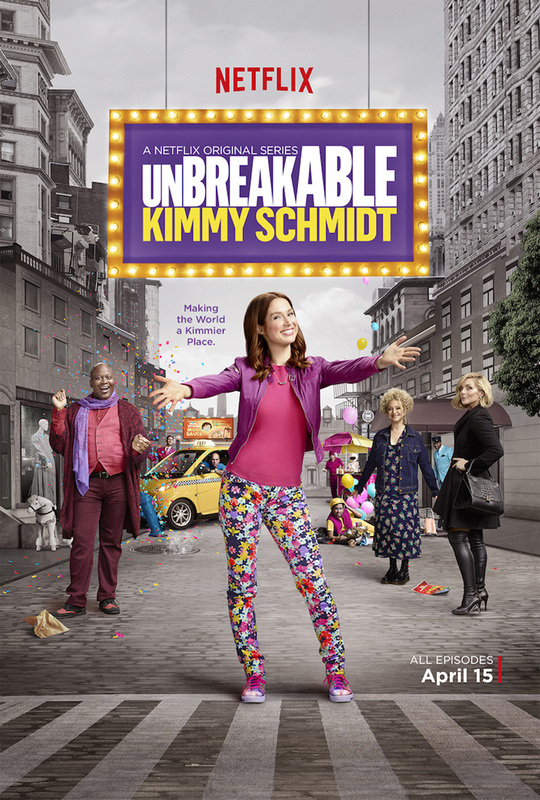 It is because Kimmy Schmidt resides some place other than a typical sitcom that the show becomes this broad venue upon which masterful writing can discuss various themes. With the character of Lillian Kaushtupper (played by Carol Kane) we explore the conflict between old urban neighborhoods giving way to gentrification. Lillian doesn’t always have the best responses but she offers a compelling portrait of someone who finds herself being pushed out in the name of progress. With the character of Jacqueline White, we have a latter-day “The Awakening” story by Kate Chopin. Jacqueline comes to realize in middle-age that her whole life has been a sham of social climbing in Manhattan. She makes various awkward attempts to be true to her Native American heritage. Then we have the character of Titus Andromedon (played by Tituss Burgess) who is forced to do more and live more after having come out gay. Originally born Ronald Ephen Wilkerson in Chickasaw County, Mississippi, Titus Andromedon experienced his own awakening that led him to live in New York City. However, in the intervening years, he has frittered away much of his promise as an aspiring actor/singer. Very good point about the dark background to this show. It is amazing how it still manages to feel both fun and real despite it (or maybe because of it). Quite the balancing act. One of the best shows!